International App Store Optimization (ASO) can be quite complicated, so it is important to know what you are getting yourself into. This is the third article in a four-part International ASO series that walks through the high-level concepts and nitty-gritty details you need to know when creating and implementing an International ASO strategy. The first article of this series discussed the basics of International ASO and the strategic elements to consider when determining which countries to target with an ASO strategy. The second article detailed the major differences in how the iTunes App Store and the Google Play Store approach country and language combinations, and how those differences can impact your ASO strategy and rankings. 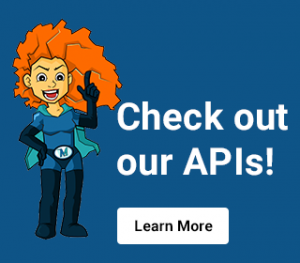 This article will discuss keyword research for International ASO, and how to upload and verify your app metadata correctly in both app stores. The final article of this series (not published yet) will outline how to track your success and will also share details about how to tweak and test nuanced keyword variations continue to drive and hopefully improve international keyword-rankings. Just a heads up, this article is geared towards readers who are already familiar with the fundamental concepts and Best Practices of ASO. It builds on International ASO concepts originally discussed in the first two articles of this series, so it would be helpful to check those articles out, if you haven’t already. If you’re new to ASO or want to brush up on the basics, we’ve included a list of great resources on the topic at the end of this article that should help you get up to speed on the basics quickly. EX: Some languages may have search patterns that suggest native speakers will tend to place higher value on an app’s accuracy and functionality, while other languages have search patterns that suggest speakers are more concerned about whether or not an app is free or ad-free. The impact of these language trends can vary based on the type of app you are promoting, so it’s important to do your own keyword research (discussed more below). In the best international ASO strategies, the potential keyword targets are translated and localized before the keyword research begins. This can be a bit cumbersome if you are working on a region or a language that is not your native tongue, but the natural keyword patterns in the first round of keyword brainstorming and translation can help reveal the linguistic nuances that people who speak various languages value. Some audiences may search in more than one language or alphabet, so with ASO, it is often valuable to include non-native keywords with all possible language permutations in the keyword research stage. In regions where English is a prevalent 2nd language, it is especially common for international searchers to combine words from their native language with English words, particularly when they relate to tech or pop-culture. In other cases, there are also also nuanced alphabet, punctuation and accenting options that can be tested and optimized for when you are fine-tuning ASO keyword targeting and rankings, and these will be discussed more in the next article in this series. Once you have prepared an initial list of all your possible translated and localized keyword ideas, it’s time to formally compare and evaluate them. Since the app stores don’t provide much information about the relative value of different keywords in their store, it is important to use third-party keyword research tools to determine which of the keyword ideas from your list are the strongest performers in each particular store, language and country combination. 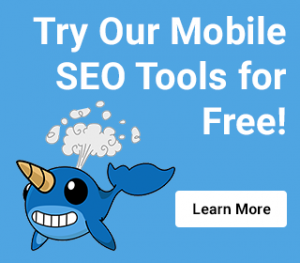 The keyword search volume and competition data that you get from third-party ASO keyword research tools is generally provide in the form of a ‘score’. The scores are relative metrics (usually out of 10 or 100) that each of the tools calculates and estimates based on data from the stores and their own proprietary algorithms. EX: In SensorTower, keyword difficulty scores close to “10” mean the keyword is very difficult to rank for; difficulty scores close to “1” mean the keyword is easier to rank for. SensorTower is a great tool for international ASO because it provides free search volume data and keyword difficulty metrics. It limits how many keywords you can track per account, but for apps with very lean budgets, creating multiple accounts with different keywords should give you the data you need. It provides ASO information for 84 countries, which is more than almost all the ASO tools we’ve tested (excluding TheTool), which makes it great for International ASO. Lastly, it has features such as “Keyword Research” and “Keyword Suggestions” that can help with the brainstorming process. The main downside to SensorTower is that it limits the number of keywords that you can track, and it deletes your historical keyword data when you remove keywords from your account, so it does not keep a large historical database of keyword rankings (like App Annie does). Therefore, you must maintain an active account that monitors all of your keywords at all times, even if you are not currently targeting the keyword in your metadata, which limits the long-term value of the tool’s data, and means you will have to store that data for yourself in an external repository. 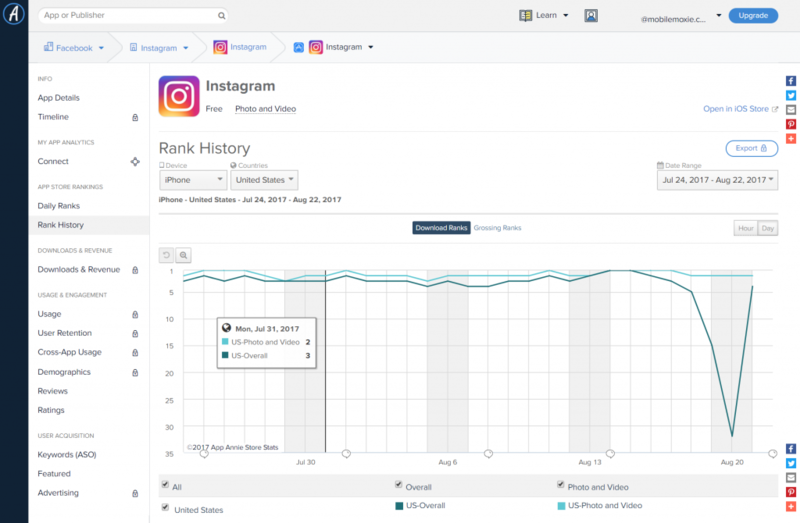 App Annie has the biggest database of historical keyword ranking data, so it’s possible to get a sense of how apps have performed for popular keywords over time, which is helpful for apps that have a seasonal component. Keyword information is tracked and stored, even if you have not created an account yet to track those apps. App Annie does not provide free keyword difficulty metrics, so you will need to lean on other tools (like SensorTower) to get that data if you’re on a tight budget. If you have more to spend, they offer a premium competitive intelligence service that includes keyword volume and competition. 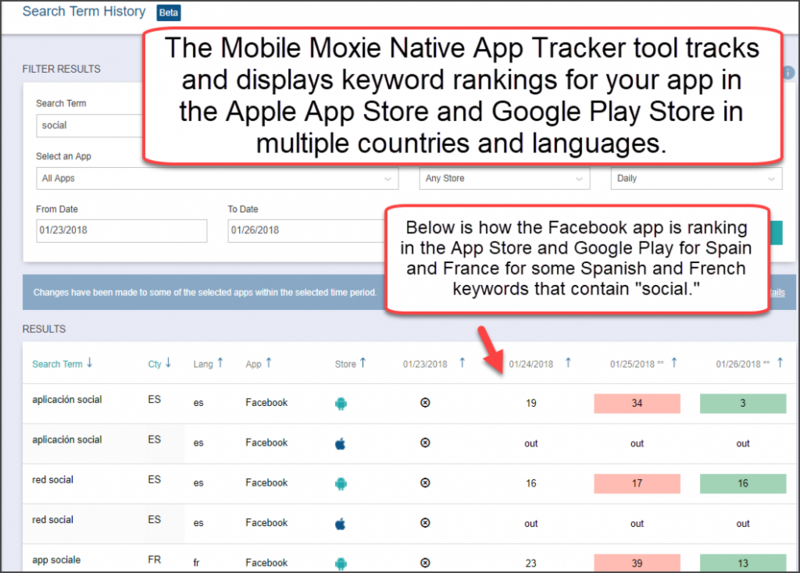 The MobileMoxie Native App Tracker (beta) displays keyword-ranking data for iOS and Android Apps in multiple countries, in one view. This style of reporting makes it easy to see how an app is currently performing for relevant keywords in multiple countries and stores. It is also easy to detect keyword-ranking shifts with this tool because rankings are color-coded. The MobileMoxie Tool does not have a large historical database (like AppAnnie does) and does not have keyword difficulty data (like SensorTower does). Its main function is International ASO reporting and improvement strategy, which we’ll discuss more in the next and final article of this series. 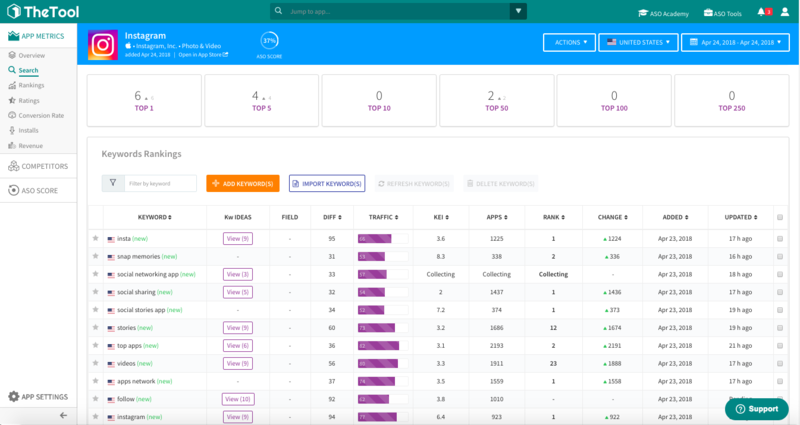 TheTool provides data for keyword search volume, keyword difficulty, and keyword rankings for 91 countries, which is more countries than any other ASO tools that we’re aware of. Like many other ASO tools, TheTool offers keyword suggestions to help with brainstorming, which can be helpful. TheTool also provides a “Global ASO Report” that shows how your ASO strategy is performing globally, which is great for International ASO. 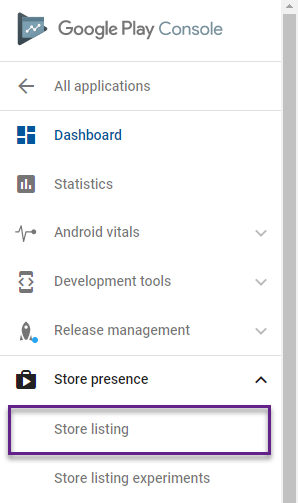 It also provides “Installs per Keyword” data for apps in the Google Play Store (feature in beta), which shows the organic keywords that drive the most app downloads. This install data is taken directly from Google Play Console. It seems this data is currently only available to some developers, but according to TheTool, it is available to anyone who integrates their Google Play Console account with their toolset. As far as we know, other ASO tools don’t seem to offer this “Installs Per Keyword” feature. You have to pay to access any keyword metrics, and if you want the Global ASO Tool, you have to pay for one of the higher-tier plans. Also, no historical data is provided. As mentioned above, you must integrate TheTool with your Google Play Console account to get “Installs Per Keyword” data, which could be an issue for ASOs who do not have access to Google Play Console. Additionally, “Installs” data is not split up by country, which is limiting for International ASO. AppTweak monitors keyword search volume, keyword competition, and keyword rankings for 76 countries. It could be useful as a second data source, in case you want to verify keyword research data from other ASO Tools. You have to pay to access any keyword metrics. Though AppTweak provides many “best suggested keywords” it only included single-word data, so it’s limited as a brainstorming tool. We also found that the user interface was busier than other ASO tools, which made navigation challenging. 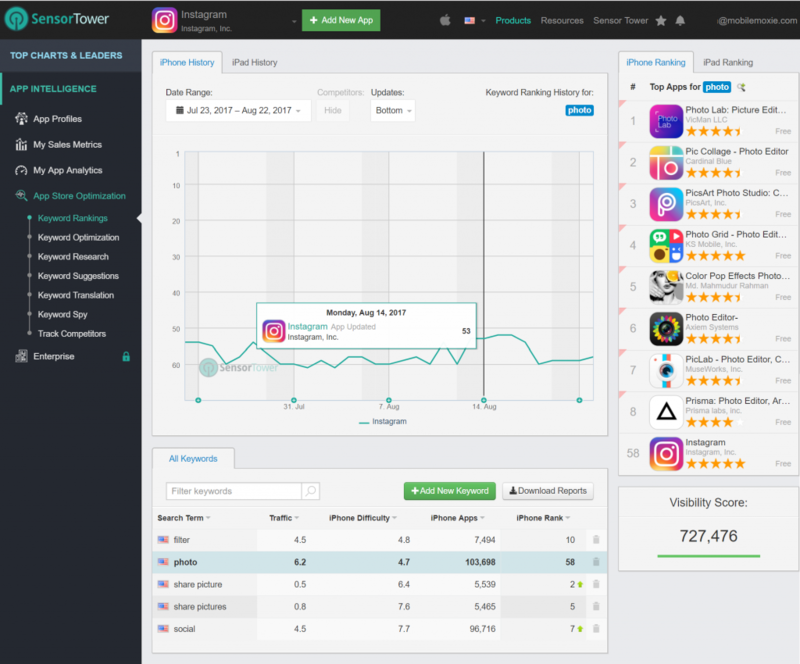 The grid below shows Keyword Search Volume and Competition scores from the top tools in the industry, for the same app store, country and keywords, over the same period of time. You can see that the variation could cause you to make different decisions, based on the keywords tool that you are using. For this reason, it may be valuable to consult multiple tools whenever you are making high-stakes decisions about ASO keywords, for instance if you are making decisions about keywords for an app title, slogan or marketing tagline.The goal of keyword research is to pick terms with high traffic and low competition that your app will be able to rank for. Different tools call these metrics slightly different things, but they are usually some variation on ‘Keyword Volume’ or ‘Search Volume’ and ‘Keyword Difficulty’ or ‘Competition’. When you are comparing or evaluating Keyword Volume and Difficulty numbers from third-party tools, always remember that they are just the best guess of the tool company and not a real number from the stores. If your app has already launched, it is possible that it is already ranking for certain words, so this should also be noted. Knowing the current ranking of an app on a particular keyword will give you a better idea of how easy or hard it will be for your particular app to improve rankings on that term. An app that is ranking in position #200 for a keyword that has never been targeted may be able to create significant change, just by targeting the keyword in the metadata; But if the app metadata is already targeting the keyword (plural, singular, gerund) and is still ranking in position #200 may struggle more to achieve change. Remember, as discussed in Article 2, both app stores have some metadata localizations that seem to impact other metadata localizations, which gives you the opportunity to leverage additional keywords in different countries. Since you will have to choose the top performing keywords, and eliminate ones that drive lower traffic or are too competitive, the best strategy is to save the keywords that don’t make the cut in the main metadata in the other localizations, whenever possible. Once you have completed the keyword research for the translated and localized keywords, and used those keywords to write app metadata for the countries that you want to target, you simply need to upload that metadata to iTunes Connect and Google Play to make it live, so that it can start having a positive impact. This section will discuss how to correctly input localized metadata into iTunes Connect and Google Play. 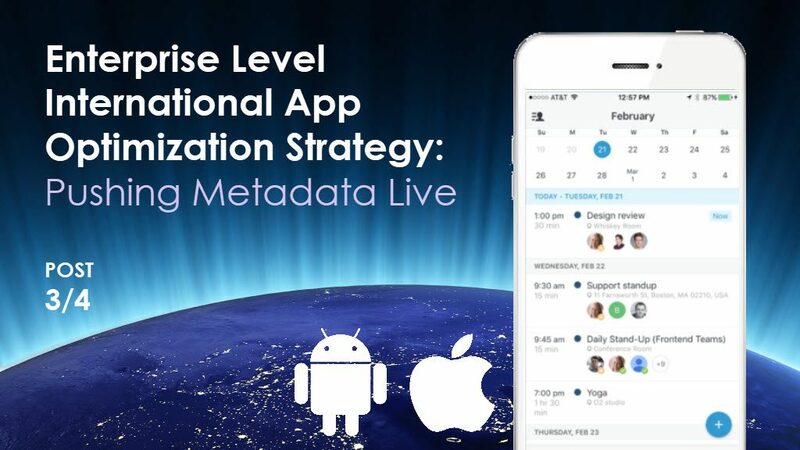 It will also discuss how to organize and coordinate multiple the metadata submissions, which may be particularly helpful for complex, ongoing, enterprise-level International ASO projects. Select “My Apps” from the iTunes Connect homepage, then select the app that you’d like to add localized metadata to. Select “App Information” in the left navigation and select the blue link with your app’s primary metadata language to reveal a drop-down. Hover over the localized metadata you want to remove and remove it by clicking the red circle displayed on the right of the language. Select “App Information” in the left navigation and scroll down to the “General Information” section of the page. Chose the new Primary Language from the Primary Language drop-down menu. Click Save in the upper-right corner. 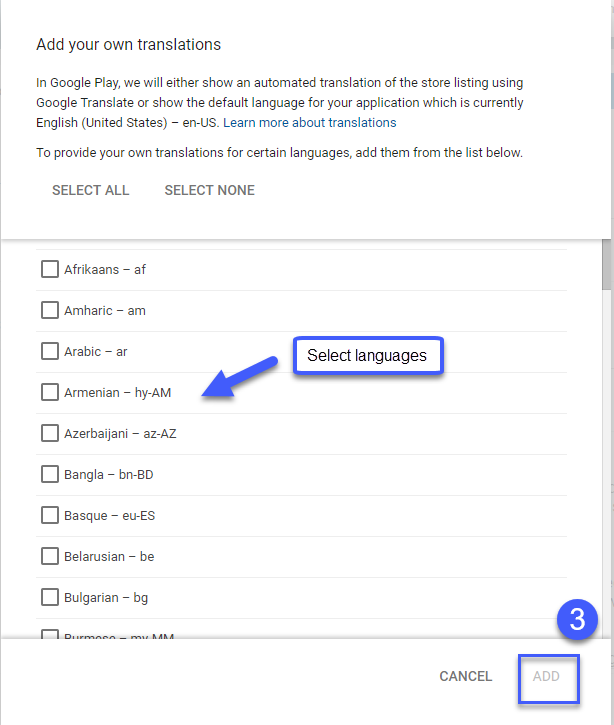 Select your target language(s), then add your localized text. 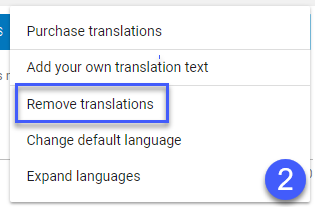 Select the languages you want to remove. 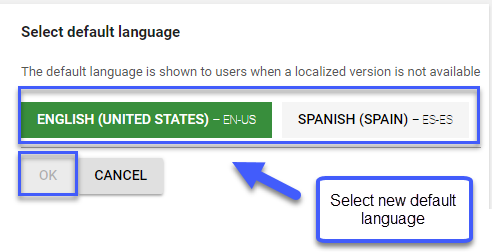 Select a new default language. International ASO has many moving parts and there are potentially multiple parties touching the metadata before the final product goes live, so once you have submitted the new metadata in the store and pushed it live, it is important to use a metadata-verification process that confirms the correct metadata is live in all locations. The best way to verify your new iOS app metadata is to check it using a live web URL. It is important to use a desktop or laptop computer to complete this task, since mobile versions of the App Store do not show all of the metadata elements, and often limit access to regional versions of the app metadata based on phone and iCloud account settings. Article 2 in this series outlined how you can modify App Store URLs to launch the app landing pages in any country; a few examples are also included below. These app landing pages will allow you to verify all of the iOS metadata except the new Promotion Text, which is currently only shown in the mobile app version of the app landing page. You also will not be able to verify the keyword tag in either location. It is not user-facing and is only viewable in iTunes Connect. Once you have submitted your Android app metadata updates in Google Developer Console, the best way to verify the international metadata is to use Google Play Store web URLs. Examples of a few international app URLs are included below, but for more details on how an international Google Play Store web URL is constructed please see Article 2 in this series. There are a few cases in which Google Play web links seem to consistently display incorrect metadata for some non-US/UK English localizations. We have seen multiple instance of a Google Play web landing pages showing English-UK metadata on the web, even when the Google Play Console metadata is clearly set-up for English (Canada) or English (India) localizations. In these instances, testing the same apps on a mobile device revealed the correct version of localized English metadata. It is unclear why this happens, but if you encounter something unexpected on the web, we recommend using your mobile device as an alternate method of verification when you encounter something weird for non-US/UK English metadata. To verify metadata changes on a mobile device, start by changing the language on your Android device (in the on-device Settings) to the metadata language you want to check, then simply view the metadata that is live in the store using a search for the brand name of the app, or some other term that you know it will rank for. 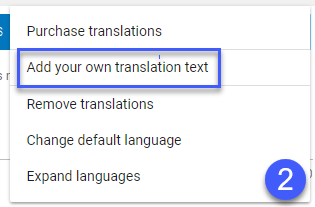 Google Play rankings have less complexity surrounding country and language settings, so this shouldn’t be hard. The primary limitation to verifying metadata through your mobile device is that you can only access and verify metadata for apps that have been published in the Play Store country associated with your device, which is determined by your billing address. You probably will not run into this restriction often when verifying metadata for enterprise-level apps, since they are likely to be available globally, and include the Google Play store for your country of residence, but this could come up in edge cases. If you need to verify metadata for an app that you cannot access on your device due to country restrictions (EX: you’re a US-based marketer trying to verify metadata for a Lite App published only in India), we recommend using the Web URL verification method instead (discussed at the top of this ‘Android’ section). If it’s critical for you to verify metadata on a mobile device for an app that you cannot access due to country restrictions, you can use a VPN to change the Google Play country on your device to a Google Play country where the app you want to verify is available. (Here is a detailed answer on Quora about how to change your Google Play Store country: How can I change my Google Play Store country?) However, in most cases, going through the VPN process is likely more trouble than it’s worth. Creating a metadata submission strategy can help keep things organized, especially if you’re juggling many apps and territories. Below, we will discuss important components to consider when creating and maintaining a metadata submission strategy for International ASO. If your task is to improve International ASO for an app that is already available in many countries, it is helpful to know how the app is currently ranking for relevant keywords in all the localizations you’re working on. It can be a bit tricky and time-consuming to do this ranking assessment because most ASO tools segment keyword-ranking data by app store and country, which can slow down the tracking process, especially if you want a quick, high-level global overview. 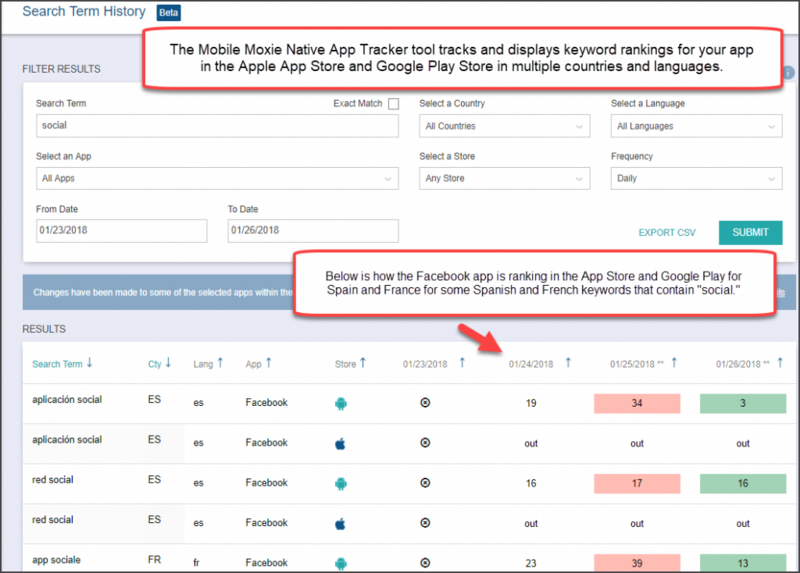 The MobileMoxie Native App Tracker tool (in beta) can help expedite this process because it displays keyword-ranking data for your iOS and Android app(s) together in all the countries where they are available, in one view – a true global perspective. For global, international and enterprise-level ASO’s it is also much easier to add new keywords that you want to track, because one keyword can be added to both iOS and Android apps, in multiple countries around the world, all from one screen with just a couple clicks. Ranking data is color-coded, so it’s easy to spot positive and negative keyword-ranking trends. As shown in the screenshot of the Native App Tracker tool above. Being able to see all of the data together can be very valuable, especially when looking at keywords between iOS and Android versions of an app. Often, if a company has launched in one store, and then launches the other OS later, companies will want to save time by re-using keyword research and targeting from the first release in a different country. While we don’t recommend this strategy, and strongly suggest that unique keyword research is valuable for each country-OS combination, the translation and localization aspects of that process often slow down the release of the app, which is also problematic. Using previous keyword research from the opposite store, which is already translated and localized, is an okay interim strategy while waiting for the translation and localization process to be completed, especially when it threatens to delay the app launch. NOTE: The MobileMoxie toolset does not yet include keyword search volume and competition like the tools described above, but these features will be added in future editions of the tool. For now, the MobileMoxie tool is just the best way to track and verify that the predictions of the other tools are impacting real-world metrics in your particular markets. Metadata iOS Metadata Fields – New App Version Required for Changes? Android Metadata – New App Version Required for Changes? Being strategic about metadata updates makes it more likely that the correct metadata will go live at the right time. The timing of your metadata updates can also enhance how well the metadata performs. iOS and Android handle the timing and ability to update app metadata differently so we should start there. iTunes requires a new app build to be submitted and approved before any metadata changes can be made. Given this requirement, development, marketing, and translation teams must work together closely in an organized workflow to coordinate iOS metadata updates. The only exception to this rule is the new “Promotional Text” field, which can be made at any time. This new metadata field mainly impacts conversion rates and does not impact keyword rankings. Google Play, on the other hand, allows metadata updates at any time, even if the app itself has not changed at all. This difference between the stores can make the process of localizing and updating metadata easier for Android than iOS, especially for more agile teams, and makes the overall process of managing and updating Android app metadata much easier and more flexible than iOS..
*This can be changed at any time but has no impact on Keyword rankings. Get familiar with how often your app will get new features or major technical improvements, and whether those updates will differ per territory. Generally, it makes sense to update metadata around the same time your app has pushes live a major update, so it’s helpful to know about likely future updates for ASO planning purposes. Determine which apps will require seasonal metadata updates, for planning purposes. Schedule the seasonal keyword research with enough time to incorporate the translation and localization processes so that they are complete before any seasonal versions of the app need to be launched in the stores. Establish which apps and territories are in the iTunes App Store, and proactively establish a tight workflow to ensure that iOS metadata updates go live at the right time. All metadata that can impact rankings for the iTunes App Store require a version update, so the schedules of various teams will need to be coordinated and a shared calendar may need to be created to maintain easy communication and make team planning and alignment easy. Determine through testing how long it seems to take for your app to experience the full impact of metadata updates and factor those findings into your update strategy. We generally recommend leaving the same metadata live for at least 3-4 weeks, to verify the full impact of metadata changes. This information is particularly helpful for the Google Play Store, which seems to respond to metadata changes a little slower than the iTunes App Store. The impact of metadata adjustments on your app’s keyword rankings can vary per app and potentially per territory, so it’s important to do your own testing. It can also change as new competitors enter or leave the market. Take note of top competitors release cycles, and monitor them over time to see if they change. 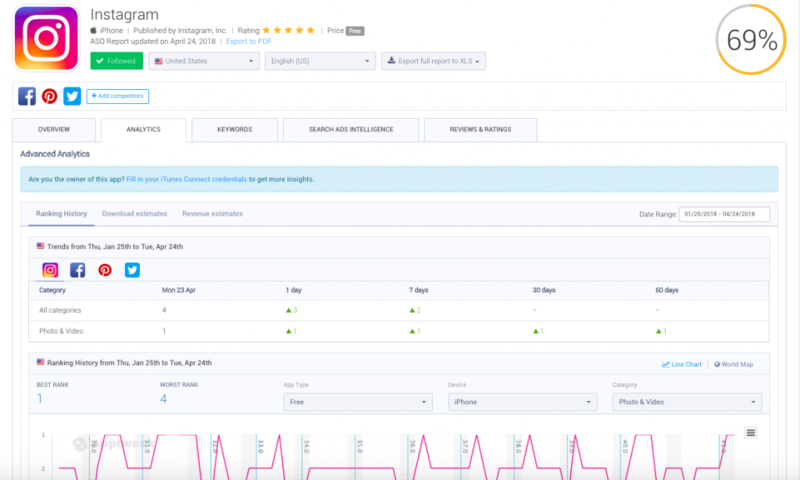 In some cases, you may be able to improve ASO by analyzing your top competitors’ release cycles and launching your version releases slightly ahead of your competitors’ schedules, to get early traction. However, this tactic can take a lot of work and coordination, and the impact can vary based on your competition, so we generally don’t recommend investing a lot of time into this until the overall ASO strategy is on solid footing. Monitor user reviews and leverage those insights in future metadata, which we will discuss more in Article 4 of this series. The app stores don’t separate paid metrics from organic metrics in their app quality evaluations; since Download Velocity is an important App Quality metric, driving it up with organic or paid downloads from app store ads, Google PPC, email campaigns, social campaigns and anywhere else traffic and downloads can be generated, will make it easier for the app to rank overall. In fact, some studies show that for every one app download that is driven by a paid ad, there are as many as 2x additional organic downloads that can be attributed to the same paid ad. Anyone who works in ASO should be familiar with how paid mobile ads work and how to leverage them in order to improve organic user acquisition for your app. Check out this informative blog post for more details about how to leverage paid app installs to improve organic downloads: Mobile marketing: How paid app installs impact organic downloads. It is important to know that the the timing of paid campaigns can change their impact on organic ASO. In both stores, the paid ads have been shown to have a much more significant impact if increases in the budget are aligned with launches and updates to the app. This makes it important to make sure that your ASO team is in constant communication with the paid team, so that calendars and launches can be aligned. iTunes App Store: As of January 2018, Apple search ads are available for Australia, Canada, Mexico, New Zealand, Switzerland, the United Kingdom, and the United States. Keep an eye on Apple’s Official Search Ads Page for updates about new Search Ad territories. Google Play Store: Google created a “Lifetime Value Calculator” (or “LTV Calculator”) to help you understand and plan for paid user acquisition in the Google Play Store, linked here: https://developer.android.com/distribute/ltv-calculator.html. The calculator works for domestic and international markets, as long as you input data that is specific to the country or region you’d like to target. To learn more details about how the calculator works, check out this in-depth blog post by David Yin, one of Google’s Google Play Business Development Managers: Taking the guesswork out of paid user acquisition. It is also important to note that the paid ads in the app stores are not forced to adhere to the same limitations in terms of trademark restrictions and competitive targeting. This means that it is completely ok with the stores to bid on your top competitors brand names or app names, and rank for them This can be a good way to build awareness for a competitive product in a tough space where there are only a few top apps that dominate the awareness. Just be sure that if you choose this strategy, that you are managing your budgets closely, since this tactic can drive up costs rather quickly, without driving a high proportion of downloads. This fact can also have a secondary, negative impact on the health of the over-all ad campaigns, so segment these as much as you can from other paid campaigns in the app stores. If you followed the instructions in Article 1 of this series about researching the country needs and demographics to plan your app launch, you should have a pretty good idea about the level of priority for each of the countries that are included in your app launch plan. With this research in mind, you can take steps towards getting everyone on your teams organized and on the same page, to ensure a smooth, error free metadata submission process for all countries and languages. Get everyone on the same page about which apps and countries are a top priority and which are less important. Do this prioritization exercise early on to help set expectations and offer guidance about ASO resource allocation. Create a shared calendar or invite ASO representatives to development sprints, to ensure that communication about deadlines and changes for launch dates are always up-to-date. Consider circulating a sign-off sheet that must be approved by all parties before each app version release. This sign-off sheet should include any metadata changes that will go live with the version update if there will be changes. This process helps the team stay coordinated for each app update and helps clarify what metadata has been touched, by whom. Work with developers to establish a release schedule for the app. The more systematic and predictable your app release schedule, the easier it is for everyone to work together to push app versions live with correct metadata. This type of predictable, clear system will keep everyone on the same page and makes metadata maintenance less likely to fall off the team’s radar. It can also be really helpful if ASO has been added people’s plate along with many other competing and unrelated priorities, which anecdotally seems to be the case for many companies. Leverage ASO tools to determine which translated and localized words are the best keyword targets. Upload metadata to each app store, and set up each country/language appropriately. Establish the best way for you and/or your agency to verify international metadata in the app stores. The next and final article in this series will talk about how to track and measure the success of your international ASO efforts. It will also provide a bit more nuanced detail about the relationship between ASO and language and how minor changes to the way words are used or written can impact your ASO success.